There are three types of people. 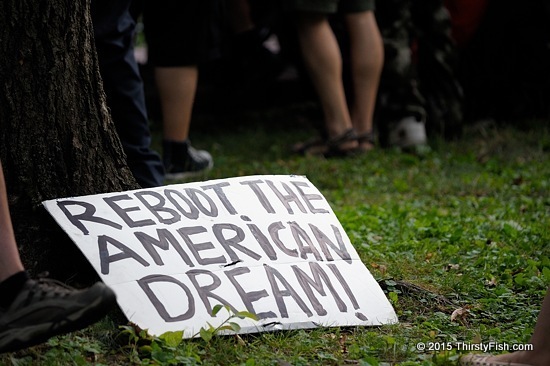 Those who believe the American Dream is still alive, those who believe that it was always a myth, and those who believe that we need to reboot it. 41% say that the American dream is impossible to achieve, while 38% say it is still possible. The American Dream is supposed to be about opportunity and socio-economic mobility for those who work hard. In 2012, the average four-year college tuition was $33,716 annually. Tuition has doubled in the last ten years. The average student debt was $28,400 in 2013, but that number is misleading; Many students who graduate owe $100,000 or more. Although we are told that the unemployment rate is hovering around 5.7%, 8.5% of recent college graduates are unemployed, and 16.8% "underemployed". Less that 40% of graduates find themselves in "good jobs", that is, jobs that pay $45,000 or more in today's market. The story of Brittney Kagee is typical for a recent graduate: Between $120,000 and $130,000 in student loan debt; a $13 an hour job in an unrelated field; $170 a month to commute to work; A room rented from a friend for $400; Loan payments $500 a month; Utilities $75, which leaves $150 to $200 for groceries: "I still remember being 18 and thinking, I'm an adult and the whole world is ahead of me. I can become anything. I can have the American Dream. I can have a successful life. All I have to do is go to college..." With monthly payments of $500, it would take her over 60 years to payoff her student loans. Student loans survive bankruptcy and when unpaid, "the Department of Education can garnish paychecks, levy bank accounts and seize tax refunds and Social Security without a court order". And that's what they've been doing more aggressively in the recent years.